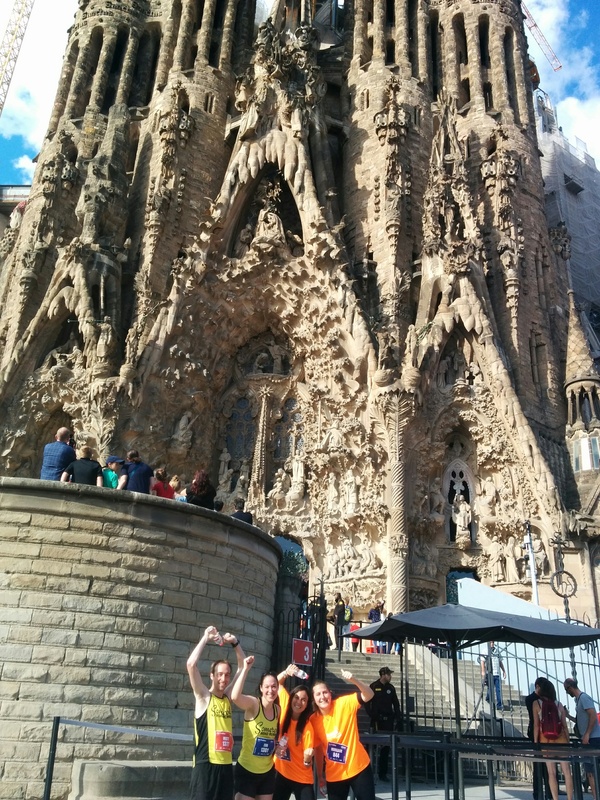 Apart from our 5k around the Sagrada Familia, we did so much more during our stay in Barcelona. 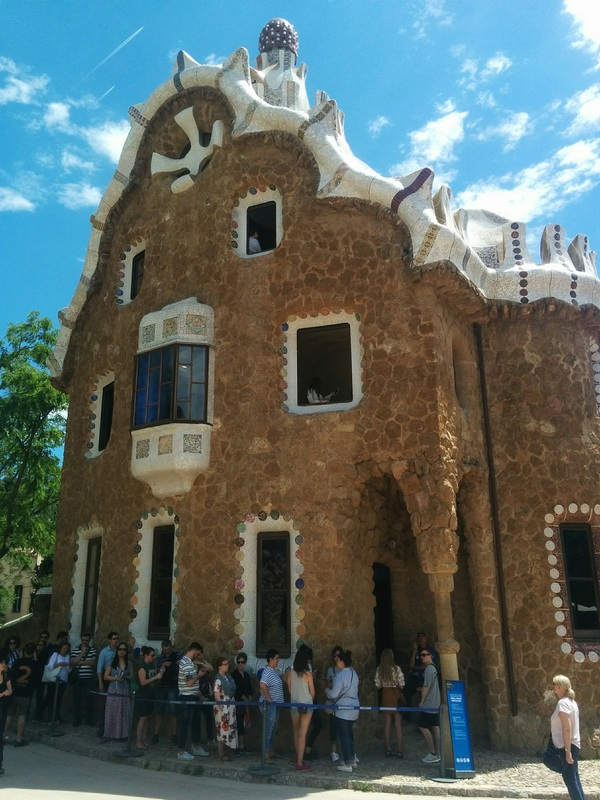 The architect Antoni Gaudí left his mark on the city and there were so many places and houses to see. Interestingly, many of them I knew from conference room names from our Barcelona office, and it was fun to see them come to life. I had been to Barcelona twice before but it’s always an adventure, and I would go back in a heartbeat. 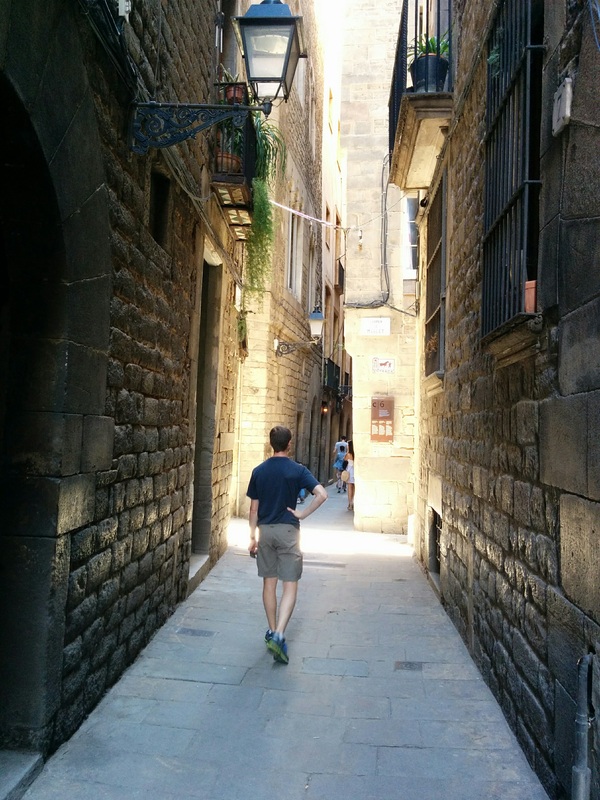 Another recommendation in our Rick Steves guidebook was a walk through the Gothic quarter or Barri Gòtic in Catalán, the center of the old city of Barcelona with buildings that date back to the Middle Ages. Since we were in Barcelona on a Sunday, we also took advantage of the free entry at the Picasso Museum where we got to enjoy more than 50 interpretations of Las Meninas. All in all, a successful trip. 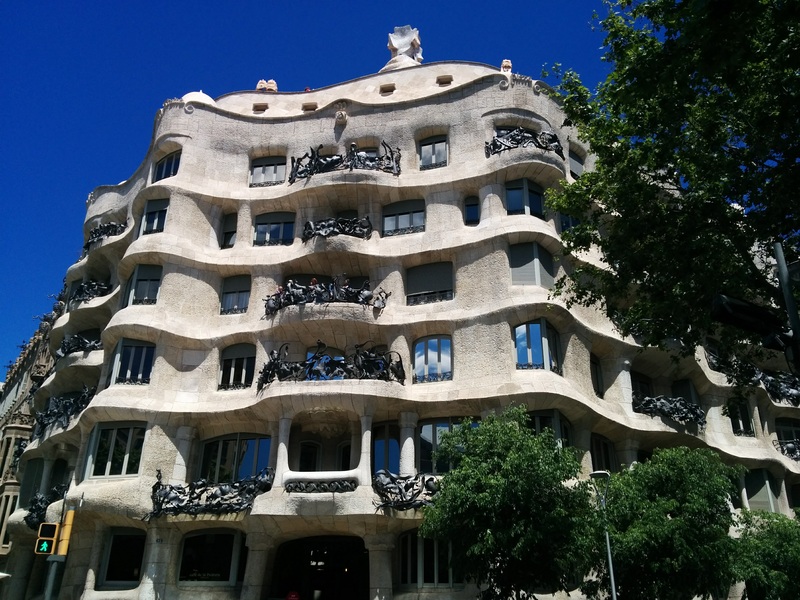 La Pedrera (Casa Milà), built between 1906 and 1912 is an icon of modernism. We skipped the steep entry fee of €20.50 and just looked at it from the outside. La Pedrera (Casa Milà), gebaut zwischen 1906 und 1912 als Ikone des Modernismus. Wir haben uns den hohen Eintrittspreis von 20.50 € gespart und es nur von außen betrachtet. The once guarded entrance gate of the ancient Roman city of Barcino with the Cathedral of Barcelona in the back. Das einst bewachte Eingangstor der historischen römischen Stadt von Barcino mit der Kathedrale von Barcelona im Hintergrund. The narrow streets of the Gothic quarter were a delight to explore. Die engen Gassen im gothischen Viertel waren herrlich zu erkunden. 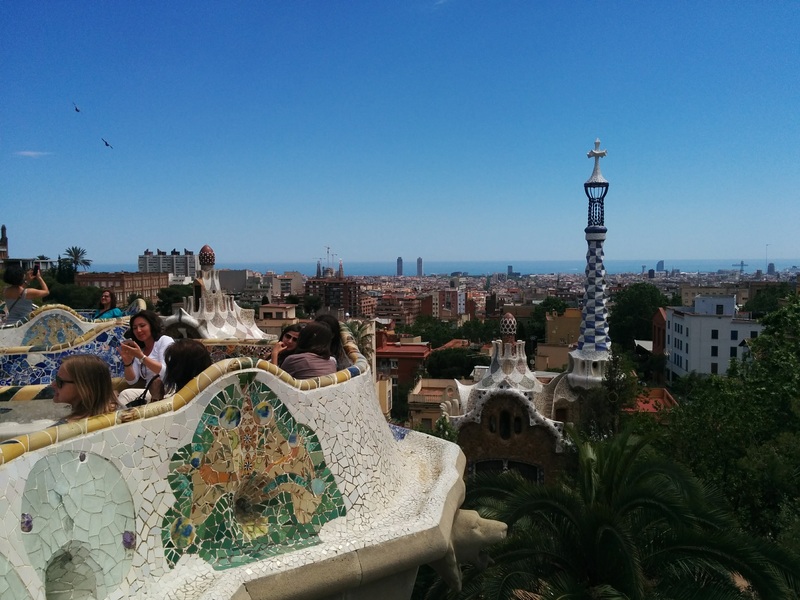 Park Güell, originally designed as an upscale housing development for early-20th-century urbanites, showcases iconic Gaudí features and is a must-see in Barcelona. Park Güell, ursprünglich als gehobene Wohnsiedlung für Städter im frühen 20. Jahrhundert gedacht, zeigt ikonische Gaudí-Merkmale und ist ein Muss in Barcelona. 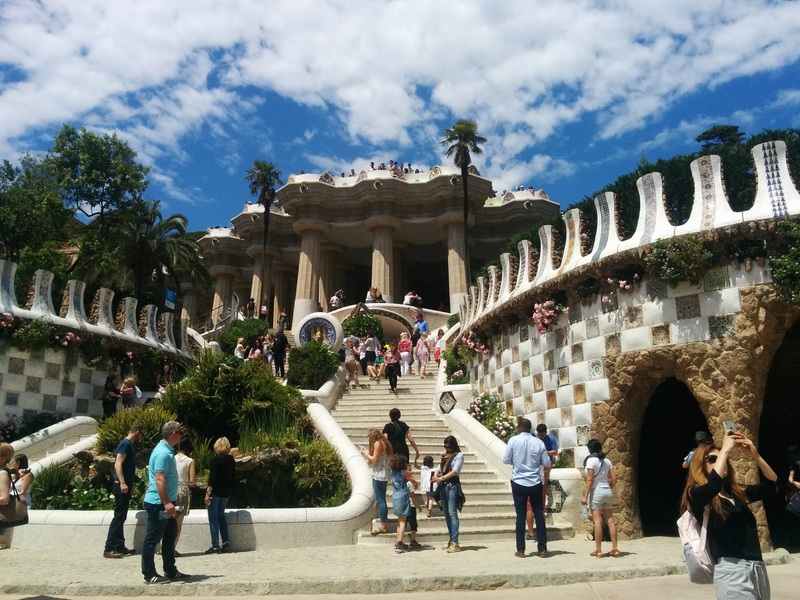 The grand stairway with three fountains in the middle: rocky and leafy, a red-and-gold-striped Catalan shield with the head of a serpent poking out, and a very famous dragon, the icon of the park. Die große Treppe mit drei Brunnen in der Mitte: steinig und begrünt, ein rotgold gestreiftes katalanisches Schutzschild mit einer Schlange, die den Kopf rausstreckt, und ein berühmter Drache, das Symbol des Parks. View from the Monumental Zone, which requires a ticket, whereas the rest of the park is free. The key is to buy the tickets in advance since they’re timed to avoid having to wait until reaching your entry time. The terrace offers a fantastic view of the city, and the bench is designed to fit your body ergonomically. Blick von der monumentalen Zone, für die man ein Ticket braucht, während der Rest des Parks kostenlos ist. Fuchsig ist es, die Tickets vorher zu kaufen, da sie für eine bestimmte Eintrittszeit sind und man so nicht warten muss, bis man dran kommt. Die Terrasse bietet einen fantastischen Blick auf die Stadt und die Bank ist so konstruiert, dass sie sich an deinen Körper anpasst. Neben unserem 5km-Lauf um die Sagrada Familia haben wir noch so viel mehr während unseres Aufenthalts in Barcelona gemacht. Der Architekt Antoni Gaudí hinterließ seine Spuren in der Stadt und es gab so viele Orte und Häuser zu sehen. Interessanterweise kannte ich viele davon von den Namen unserer Meetingräume an der Arbeit von unserem Standort in Barcelona und es war lustig, sie in echt zu sehen. Ich war vorher schon zweimal in Barcelona, aber es ist immer ein Abenteuer und ich würde sofort wieder hinfahren. Eine weitere Empfehlung aus unserem Rick-Steves-Reiseführer war ein Spazierung durch das gothische Viertel oder Barri Gòtic auf Katalanisch, das Zentrum der alten Stadt von Barcelona mit Gebäuden, die bis ins Mittelalter zurückgehen. 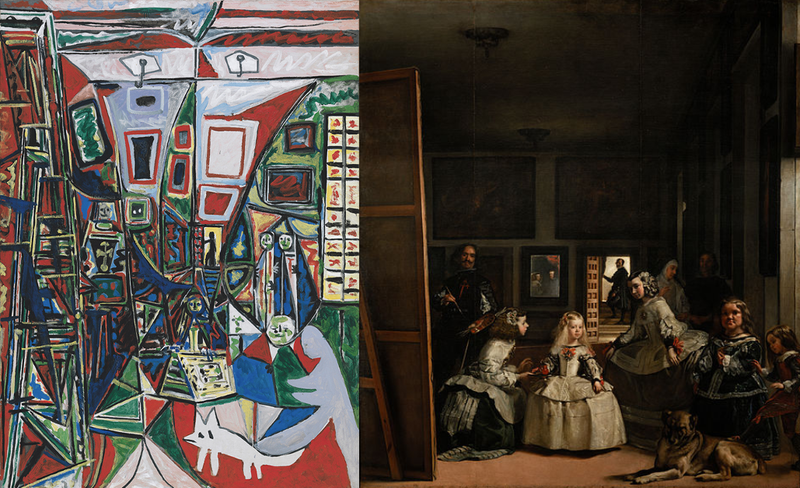 Da wir an einem Sonntag in Barcelona waren, nutzen wir auch den kostenlosen Eintrott beim Picasso-Museum aus, wo wir mehr als 50 Interpretationen von Las Meninas bestaunen konnten. Alles in allem eine erfolgreiche Reise. 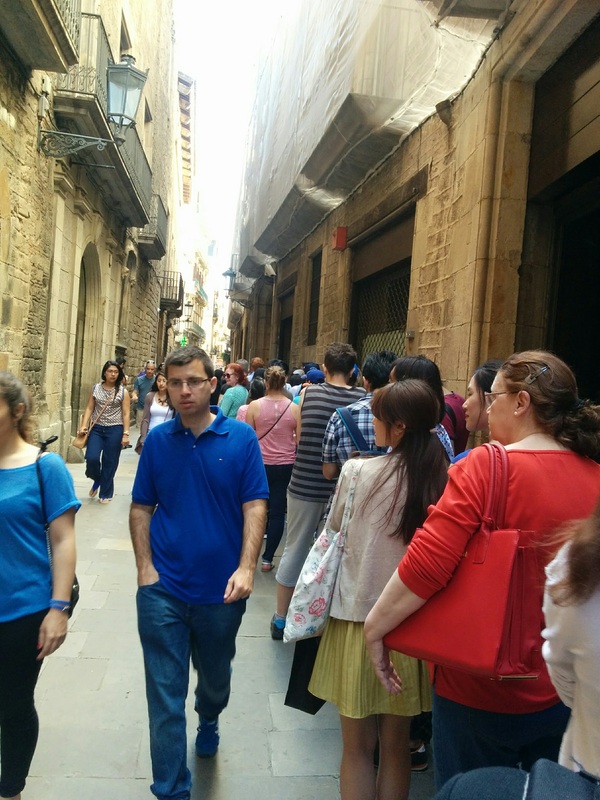 The line to get into the Picasso museum during free hours. It only took a little more than 30 minutes to get our timed ticket. We lucked out because when we entered, the museum had sold out. Die Schlange für die kostenlosen Stunden im Picasso-Museum. Es dauerte nur ein bisschen mehr als 30 Minuten, um unsere Zeittickets zu bekommen. Wir hatten Glück, denn als wir reingingen, war das Museum bereits ausverkauft. 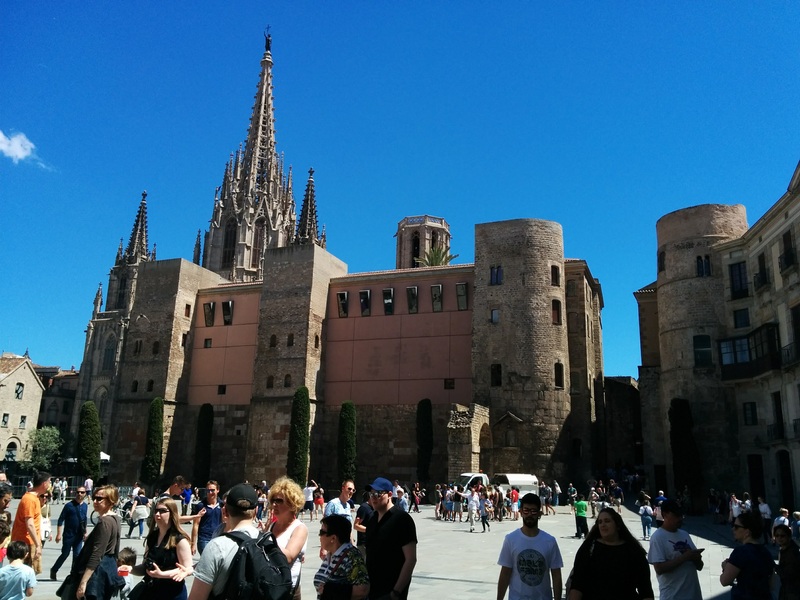 This entry was posted in Europe, Spain and tagged Art, Barcelona, Gaudí, Las Meninas, Picasso, Sagrada Familia, Sightseeing, The Romans, Train Strikes, Travel, Walking on May 27, 2017 by Eva. 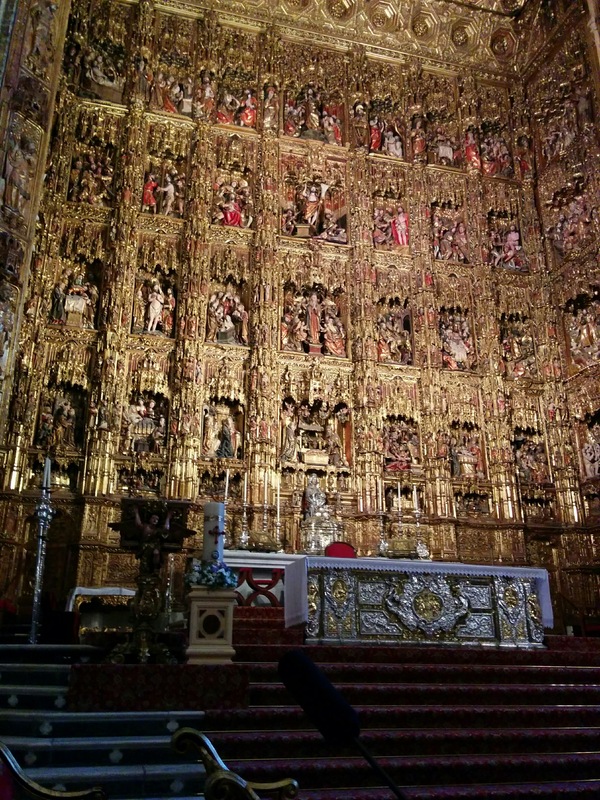 I’m going a little out of order here but now that the crazy stories have been written, apart from Matt catching a stomach virus at my parents’ house and having to spend time in bed rather than with family, I wanted to take some time to write up our experience from Sevilla. Sevilla is a true Andalusian gem. Coming from busy​ Madrid, Sevilla felt like a small town. I went there in 2001 as a side trip from Málaga while being part of a 3-week Spanish program, and I couldn’t wait to return. And oh sure were we not disappointed. 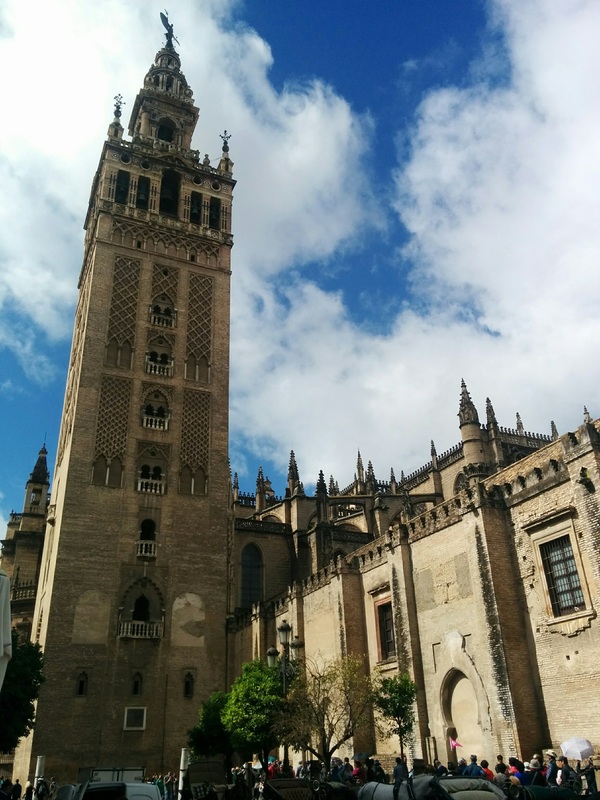 The main attractions in Sevilla are the Alcázar and the cathedral, along with the Giralda Bell tower. 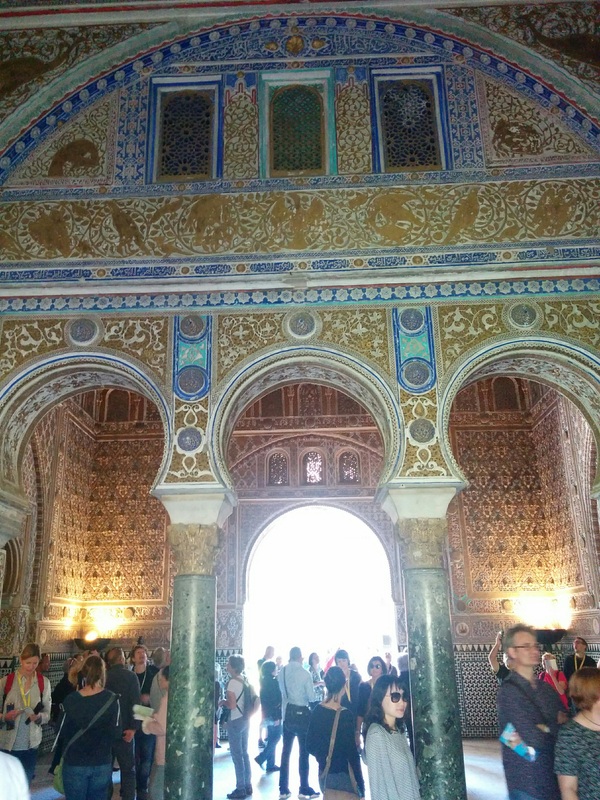 The Alcázar is a medieval royal palace known for its mudéjar architecture, a style of medieval Iberian architecture and decoration that was strongly influenced by Moorish taste and workmanship. For a little history background: Spain was invaded in 711 by Muslims, known as the Conquista (conquest), until the Christians took their country back – the Reconquista (reconquest) that lasted until 1492 when Granada fall as the last bastion in Andalucía. After that, the mudéjars were those who stayed in Spain after the Reconquista, did not convert to Christianity but still left many traces. Just look at it. Isn’t it wonderful? Guckt einfach nur. Ist das nicht toll? 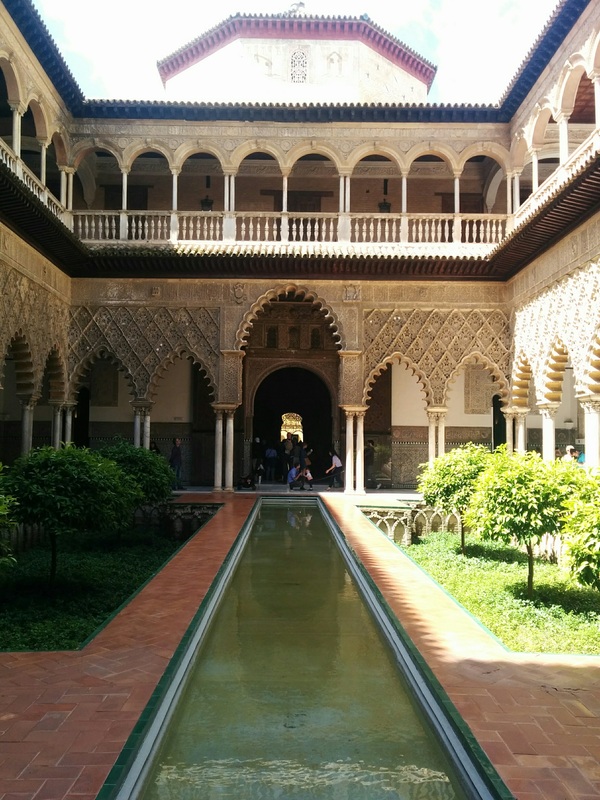 Your classic Alcázar experience: Patio de las Doncellas (Courtyard of the Maidens), the center of King Pedro’s palace, an open-air courtyard surrounded by rooms and a long, rectangular reflecting pool in the middle. Das klassische Alcázar-Erlebnis: Patio de las Doncellas (Hof der Mädchen), das Zentrum des Palasts von König Pedro mit einem Freiluft-Hof, umgeben von Zimmern und einem langen, rechteckigen Spiegelbecken in der Mitte. 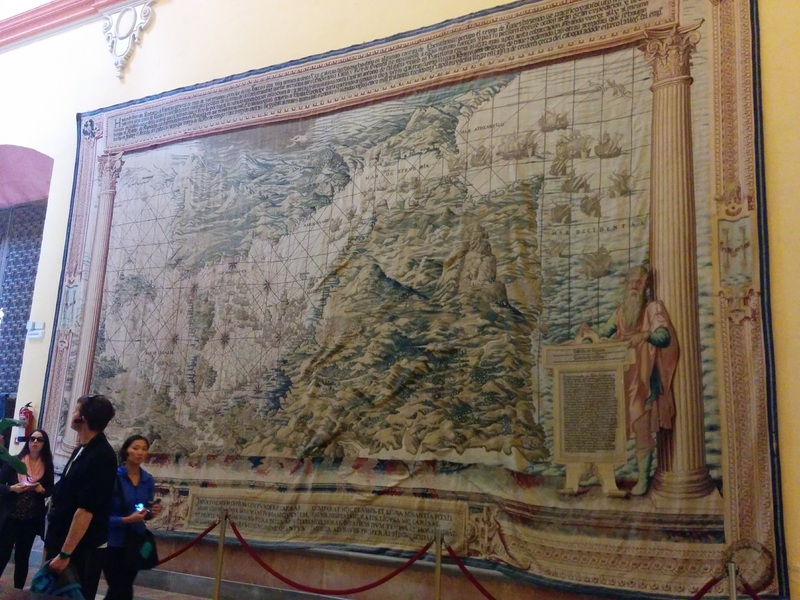 Hall of Tapestries: This map has the Mediterranean world upside down with Africa on top. Saal der Wandteppiche: Diese Karte zeigt die Mittelmeerwelt falschrum mit Afrika ganz oben. Ich springe hier ein bisschen hin und her, aber da nun die verrückten Geschichten niedergeschrieben wurden, mit der Ausnahme, dass Matt sich einen Magenvirus bei meinen Eltern eingefangen hat und die Zeit dort eher im Bett als mit der Familie verbringen musste, wollte ich mir nun ein bisschen Zeit nehmen, unsere Erlebnisse von Sevilla aufzuschreiben. Sevilla ist eine wahre Perle in Andalusien. Wenn man vom vollen Madrid kommt, fühlt sich Sevilla wie eine Kleinstadt an. 2001 machte ich 3 Wochen Sprachkurs in Málaga, einen Abstecher dorthin und konnte es kaum erwarten, wieder da zu sein. Und oh, waren wir nicht enttäuscht. Die Hauptattraktionen in Sevilla sind der Alcázar und die Kathedrale und dazu noch der Giralda-Glockenturm. Der Alcázar ist ein Königspalast aus dem Mittelalter, der für seine Mudéjar-Architektur bekannt ist, einem Stil aus der mittelalterlichen iberischen Architektur und Deko, die stark von maurischem Geschmack und Qualitätsarbeit beeinflusst war. Um ein bisschen geschichtlichen Hintergrund zu geben: 711 marschierten Muslime in Spanien ein, was bekannt ist als die Conquista (Eroberung), bis sich die Christen ihr Land wiederholten – die Reconquista (Wiedereroberung), die bis 1492 ging, als Granada als letzte Bastion in Andalusien fiel. Danach waren die Mudéjar diejenigen, die in Spanien nach der Reconquista blieben, aber nicht zum Christentum konvertierten, jedoch viele Spuren hinterließen. 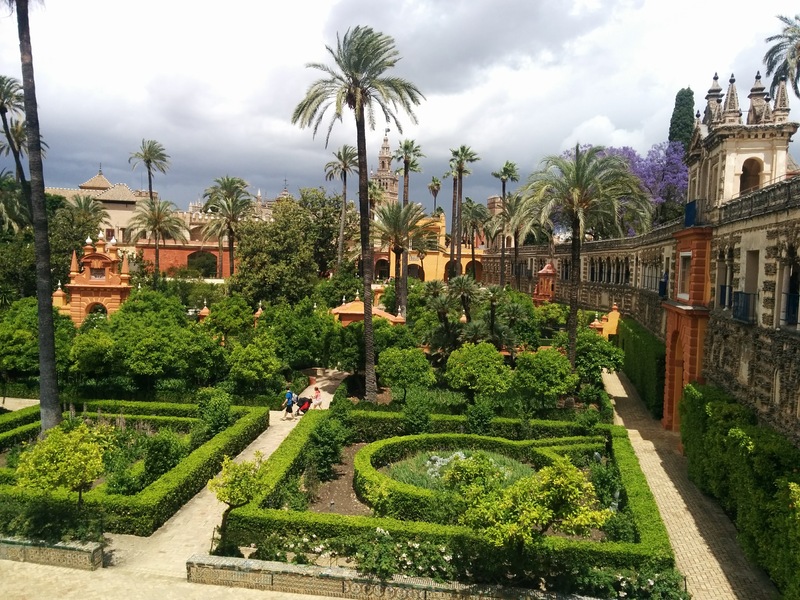 The Moorish garden where Christian and Islamic traditions merge. Both cultures considered water and nature part of their architecture. Der maurische Garten, in dem christliche und islamische Traditionen zusammenkommen. Beide Kulturen sahen Wasser und Natur als Teil ihrer Architektur. The cathedral with the Giralda Bell Tower. We were able to climb up and get a nice view. The tower used to be a Moorish minaret and became a bell tower after the Reconquista. Die Kathedrale mit dem Giralda-Glockenturm. Wir konnten hochsteigen und hatte eine schöne Aussicht. Der Turm war einmal ein maurisches Minarett und wurde nach der Reconquista ein Glockenturm. The High Altar inside the cathedral, the largest altarpiece in the world, 65 feet tall with 44 scenes from the life of Jesus and Mary carved from walnut and chestnut. Impressive megalomania? Der hohe Altar in der Kathedrale, das größte Altarbild der Welt, 20 Meter hoch mit 44 Szenen aus dem Leben von Jesus und Maria, in Walnuss- und Kastanienholz eingeschnitzt. Beeindruckender Größenwahnsinn? 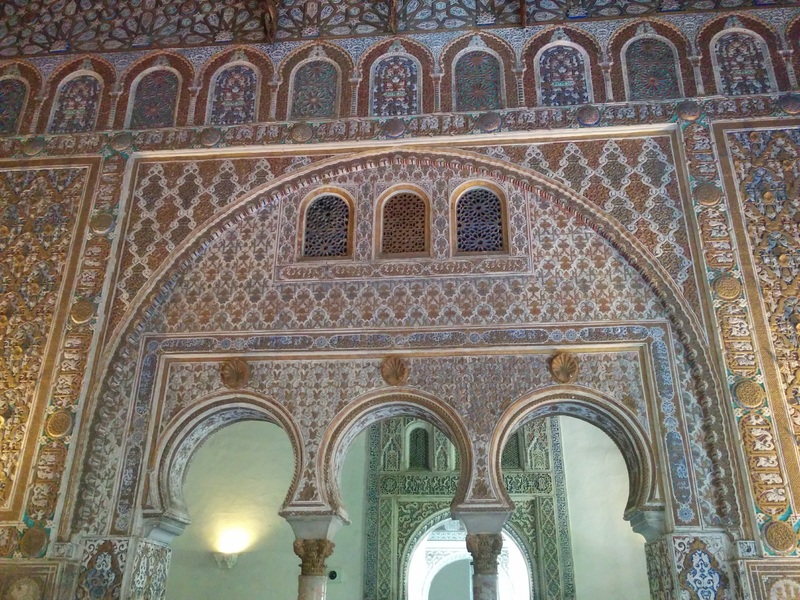 This entry was posted in Europe, Spain and tagged Alcázar, Andalusia, Architecture, Conquista, Giralda Bell Tower, Granada, Mudéjar, Reconquista, Sevilla, Spanish history, Traveling on May 21, 2017 by Eva. Running while traveling is a great way to explore new things and see places you might not have seen if you just stroll around. In Sevilla, we went for a run along the river the night of our failed arrival, and it was great. 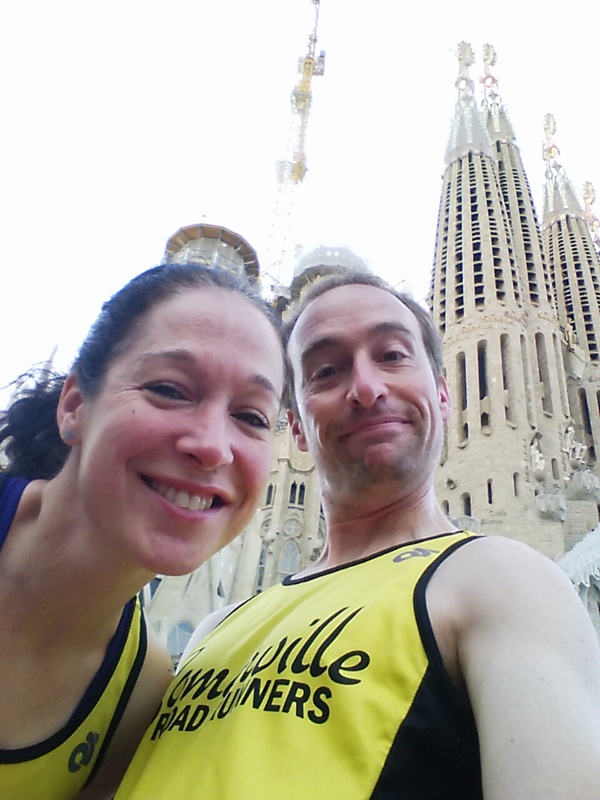 In Barcelona, we signed up for a 5k around the Sagrada Familia. Another bonus was meeting two of my co-workers in the flesh after working together for more than 1.5 years on a daily basis and seeing each other only on a screen. It was their first 5k, and I was pumped to finally meet them and to also cheer them on. The route went multiple laps around the Sagrada Familia. We had just been there the day before when we picked up our bibs close by, and the area is usually mobbed with tourists, so it was even better to return the following day with closed roads. There were multiple races going on that day. Ours was small with 200+ people, and we enjoyed every minute of it. Without a GPS, it might have been tricky to know how far along you were and how many laps you needed to do. The course ended up longer than 5k but I didn’t care. 4 weeks post marathon, I had no goals and just enjoyed looking at the magnificent Sagrada Familia. What a morning! With the Sagrada Familia. We came with our club singlets, of course. Mit der Sagrada Familia. Wir kamen natürlich in unseren Trikots von unserem Sportverein. Post race victory. The race was only €5, which included an orange shirt, granola, post race beverages and treats. Siegesfeier nach dem Rennen. Das Rennen kostete nur 5 € und dafür gab es ein orangenes T-Shirt, Müsli, Getränke danach und Leckereien. Während einer Reise laufen zu gehen ist eine tolle Möglichkeit, neue Dinge zu erkunden und Orte zu sehen, an die man sonst wahrscheinlich nicht gekommen wäre, wenn man spazieren geht. In Sevilla liefen wir am Abend nach unserer gescheiterten Ankunft am Fluss entlang und es war toll. In Barcelona meldeten wir uns bei einem 5km-Lauf um die Sagrada Familia an. Ein weiterer Bonus war, zwei meiner Arbeitskolleginnen in echt kennenzulernen und das nach mehr als 1,5 Jahren täglicher Zusammenarbeit, bei der wir uns immer nur auf einem Bildschirm sahen. Es war der erste 5km-Lauf für sie und ich freute mich wie bekloppt, sie endlich zu treffen und sie anzufeuern. Die Route ging einfach mehrere Runden um die Sagrada Familia. Wir waren gerade noch am Vortag dort, um uns in der Nähe unsere Startnummern abzuholen und die Gegend ist normalerweise knallvoll mit Touristen, deshalb war es umso besser, am nächsten Tag zu abgesperrten Straßen zurückzukommen. Es gab an dem Tag mehrere Rennen. Unseres war mit ein bisschen mehr als 200 Leuten klein und wir haben jede Minute genossen. Ohne eine Sportuhr mit Navi hätte es schwierig sein können, zu wissen wo man gerade war und wie viele Runden man noch laufen musste. Die Strecke war dann am Ende länger als 5 km, aber mir war das egal. 4 Wochen nach meinem Marathon hatte ich keine Ziele und habe einfach nur die Sicht auf die herrliche Sagrada Familia genossen. Was ein Vormittag! This entry was posted in Europe, Germany and tagged Activities, Barcelona, Races, Running, Sagrada Familia on May 19, 2017 by Eva. 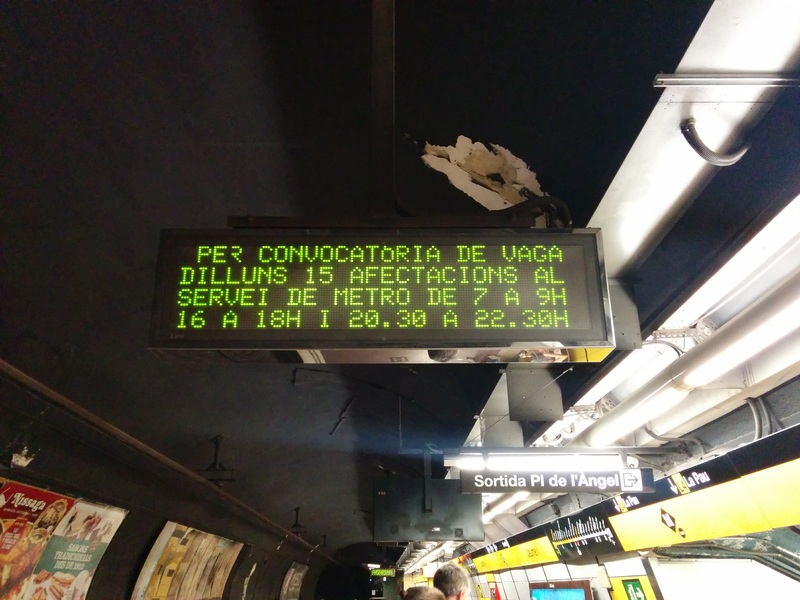 When I booked our accommodation in Barcelona, the Ding Dong Express, I couldn’t help but think of the movie “The Naked Gun” and the “Ding Dong” song… Our own ding dong experience when we arrived though, was no response yet again. Seriously? We had just gotten off our derailed AVE train, and the last thing we needed was more complications at the check-in. This time, there was a phone number on the door. Unfortunately, our cell phones don’t work in Europe, and I had to walk into a supermarket to ask the cashier if I could use his phone after wandering around not finding a phone booth because who uses a phone booth these days? Luckily, someone picked up this time and gave me the PIN to the door, so we could enter. It was supposed to be part of our confirmation number, which didn’t work. The check-in was at a machine, and after we struggled first with my hyphenated​ last name, we got to the reservation screen and paid the room tax. A room key card came out of the machine. Great! But what was our room number? We didn’t see it and tried out all the rooms. No luck. 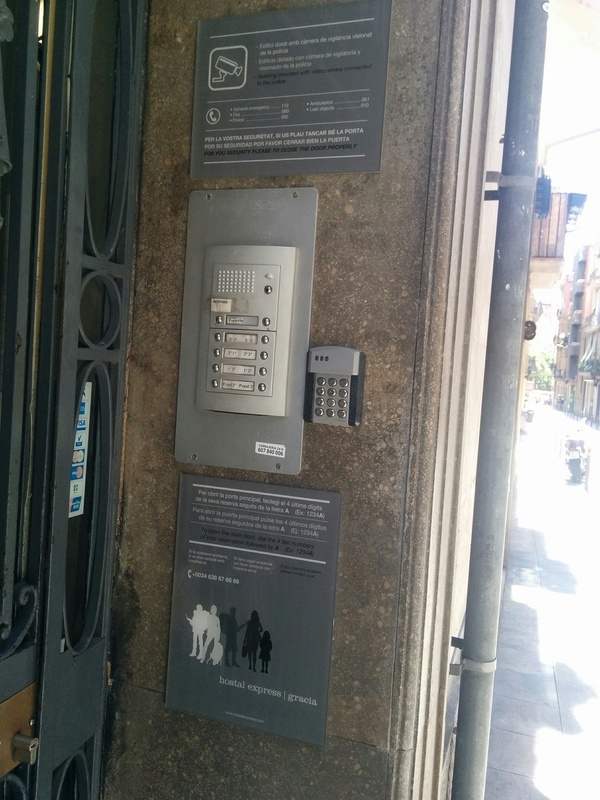 The upper floors had normal key locks without a card reader but our card didn’t work anywhere. In the end, we lucked out because someone did show up at the reception desk and told us the room number had shown up at the reservation screen but only once. The doors upstairs were just open leading to more rooms but how would you know that they were just open? The Ding Dong entrance. Der Eingang zum Ding Dong. 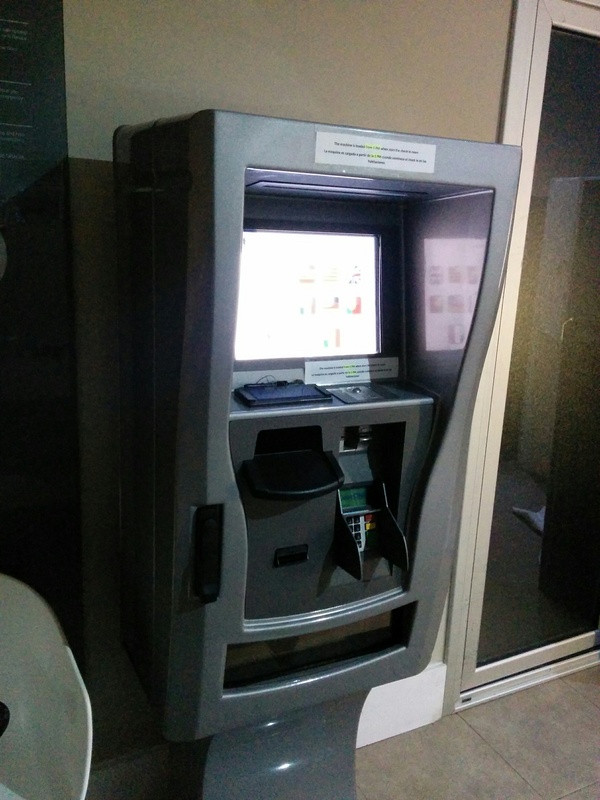 The check-in machine. Die Maschine zum Einchecken. Als ich unsere Unterkunft in Barcelona, den Ding-Dong-Express, gebucht habe, musste ich die ganze Zeit an den Film „Die nackte Kanone” und das „Ding Dong”-Lied denken… Unsere eigene Ding-Dong-Erfahrung (Klingelerfahrung) bei unserer Ankunft war mal wieder keine Antwort. Echt jetzt? Wir kamen gerade von unserem entgleisten AVE-Zug und das Letzte, was wir noch brauchten, waren mehr Komplikationen beim Einchecken. Diesmal war zum Glück eine Telefonnummer an der Tür. Leider gehen unsere Handys in Europa nicht und ich musste in einen Supermarkt gehen, um den Kassierer zu fragen, ob ich mal telefonieren durfte, nachdem wir durch die Gegend irrten und keine Telefonzelle fanden, denn wer benutzt heutzutage schon noch eine Telefonzelle? Zum Glück ging diesmal jemand dran und gab mir den PIN für die Tür, so dass wir rein konnten. Er hätte Teil unserer Bestätigungsnummer sein sollen, die nicht ging. Einchecken war an einer Maschine und nachdem wir erst mal mit meinem Nachnamen mit Bindestrich Probleme hatten, kam dann endlich ein Reservierungsfenster und wir bezahlten die Zimmersteuer. Eine Zimmerschlüsselkarte kam aus der Maschine raus. Supi! Aber wo war unsere Zimmernummer? Wir hatten sie nicht gesehen und probierten alle Zimmer aus. Kein Erfolg. Die oberen Stockwerke hatten normale Türschlösser ohne Kartenleser, aber unsere Karte ging nirgends. Letzten Endes hatten wir dann doch Glück, da jemand an der Rezeption auftauchte und uns mitteilte, dass unsere Zimmernummer beim Bestätigungsfenster aufgetaucht war, aber nur einmal. Die Türen oben führten einfach zu mehr Zimmern, aber wie hätten wir wissen sollen, dass die einfach offen waren? This entry was posted in Europe, Spain and tagged Accomodations, Adventures, Barcelona, The Naked Gun, Traveling on May 17, 2017 by Eva. 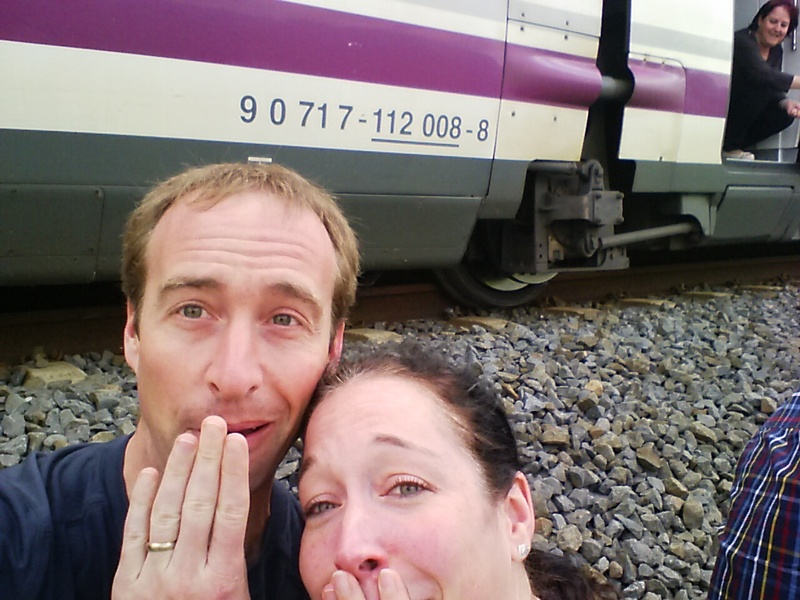 And just when we thought our Sevilla mishap couldn’t get any more exciting, our high speed train from Sevilla to Barcelona derailed. Luckily, no one was hurt. As we were riding smoothly and watching “Inferno”, all of a sudden there were loud noises, rumbling, rocks hitting the train and everyone started to wonder what was happening. 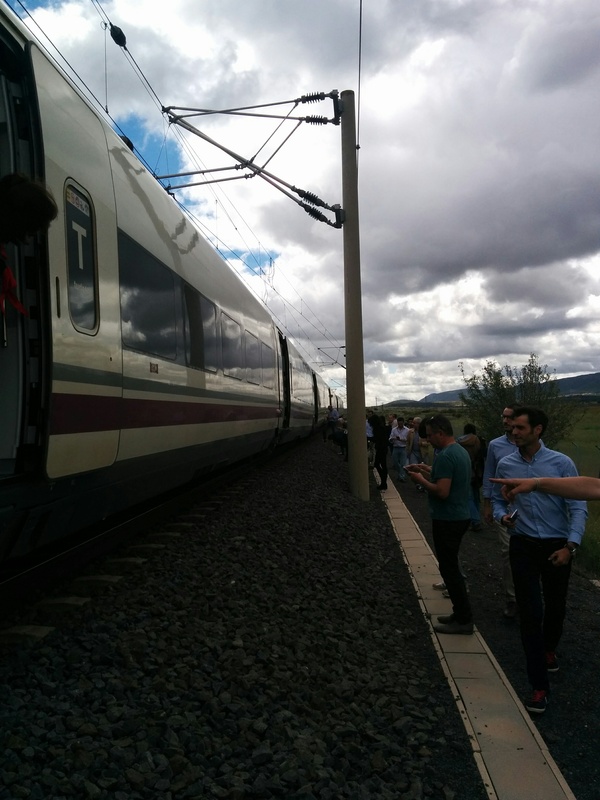 The train came to a stop near Puertollano and we saw smoke as a result of the train braking and coming down from a speed of 250 km an hour. And then we were sitting still for a very long time. In our car, the windows right behind us were shattered, yet not completely broken. While we waited, people started getting out briefly to check out the damage, and so did we. We saw that the car right in front of us had derailed, and people started taking selfies. Oh well, we couldn’t resist taking pictures either and a few hours later, another train arrived to take us to Barcelona. Things could have been much worse, so I’m glad this only caused a delay for us. Plus, the crew gave out free water, food and chocolate later, and instructions on how to get a full refund of our ticket, which we claimed the following day. Now that’s what I call great customer service! Quite the shocker. Ganz schön der Schocker. 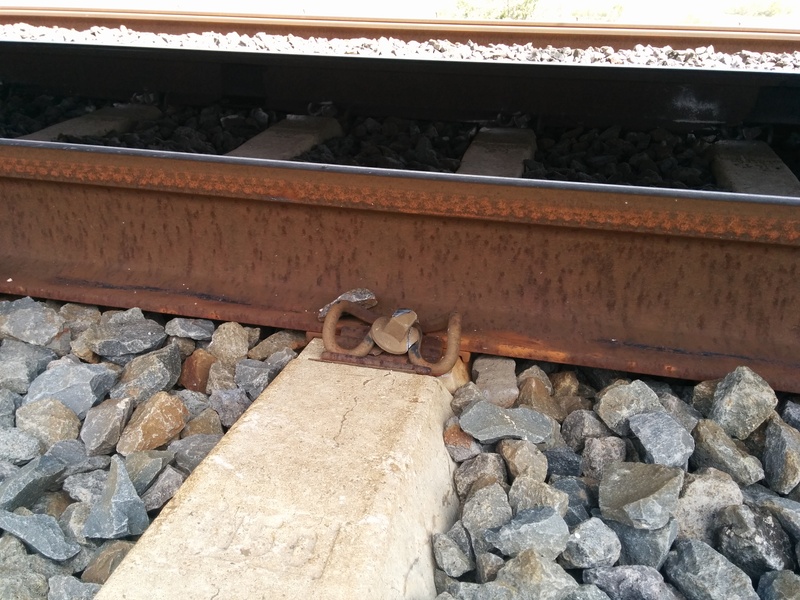 Damage to the tracks. Schaden an den Gleisen. Und gerade als wir dachten, dass unserer Sevilla-Pech nicht noch aufregender sein könnte, entgleiste unser Schnellzug von Sevilla nach Barcelona. Zum Glück wurde niemand verletzt. Wir fuhren ganz entspannt und schauten „Inferno”, als es plötzlich ganz laut wurde, Rumpeln, Steine flogen gegen den Zug und alle fragten sich, was wohl los war. 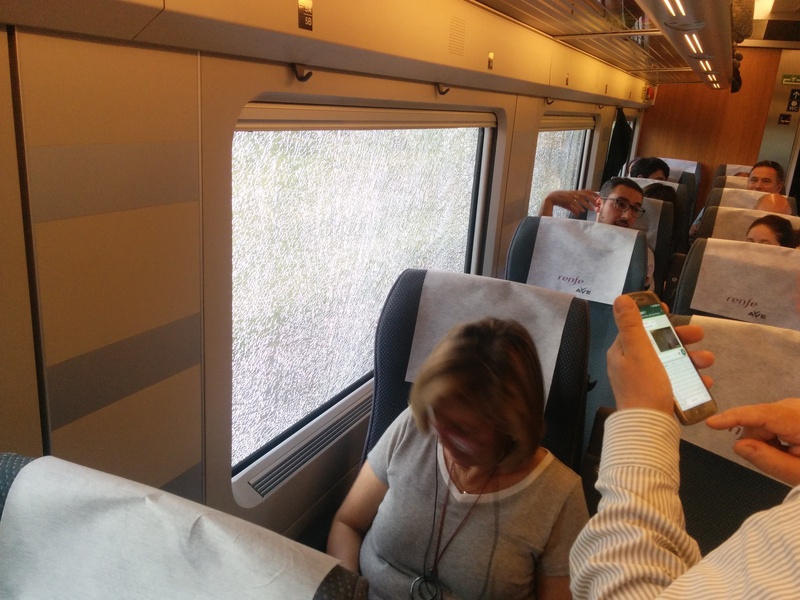 Der Zug hielt in der Nähe von Puertollano an und wir sahen Rauch als Zeichen davon, dass der Zug bremste und von einer Geschwindigkeit von 250 km pro Stunde runterkam. Und dann standen wir ganz lange still. In unserem Waggon war hinter uns das Fenster zersplittert, aber nicht ganz kaputt. Als wir warteten, stiegen Leute kurz aus, um sich den Schaden anzuschauen und wir machten das auch. 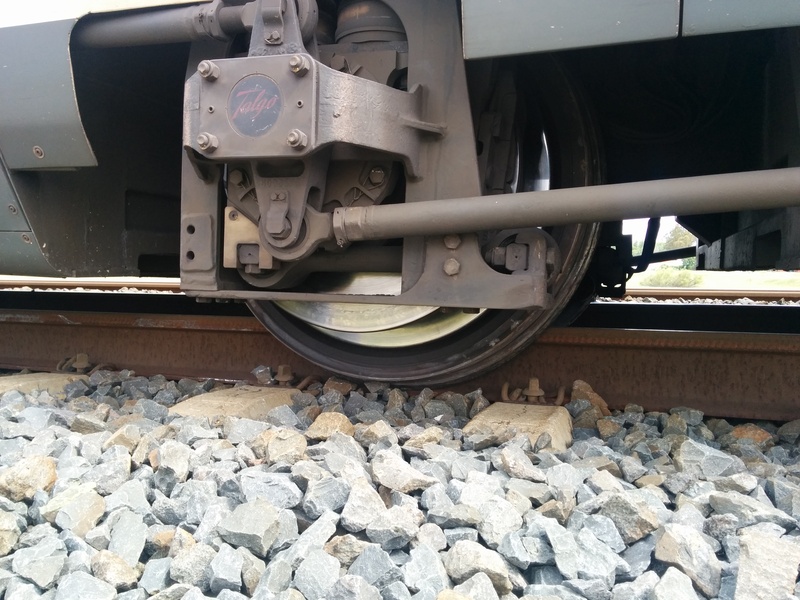 Wir sahen, dass der Waggon direkt vor uns entgleist war und Leute machten Selfies. Nun gut, wir konnten den Fotos auch nicht widerstehen und ein paar Stunden später kam dann auch ein anderer Zug, um uns nach Barcelona zu bringen. Es hätte alles viel schlimmer sein können. Ich bin froh, dass es nur eine Verspätung für uns war. Außerdem verteilte das Personal später kostenlos Wasser, Essen und Schokolade und wir bekamen noch Anweisungen, wie wir unser Ticket zurückerstatten lassen können, was wir dann am Tag danach machten. Das nenne ich mal einen guten Kundenservice! People were checking out the train until the mechanic yelled we should go back in. Die Leute haben sich den Zug angeschaut, bis sich der Mechaniker beschwert und uns reingeschickt hat. This was the seat right behind us. Scary, right? Das war der Sitz direkt hinter uns. Gruselig, gelle? Later that day, we were in the news (photo credit: Birgit). Später am Tag waren wir in den Nachrichten (Fotoquelle: Birgit). This entry was posted in Europe, Spain and tagged Accidents, Adventures, AVE, Barcelona, RENFE, Sevilla, Trains on May 16, 2017 by Eva. In German, you say “Wenn einer eine Reise tut, dann kann er was erzählen” (When someone travels, there are stories to tell), and that definitely held true for our arrival in Sevilla. Back in January, we got a travel credit card that allowed us to use some of their bonus points to reserve accommodations through their travel portal. Our place in Sevilla were apartments for rent. We would have our own kitchen and ample space. Everything looked great on the website. And then we arrived. When we got to our street and rang the bell, nobody opened the door. We were like “Oh well, must be siesta time” since it was only 3:30 pm. Killing some time, we walked around some and returned an hour later. Nothing. Getting a little desperate, we walked into the Corte Inglés department store to check the website again on my phone. It said to arrive after 4, which we did but there was nobody there. Maybe their siesta was longer? We tried again a few more times after 5 but had no luck. One time, the door was magically open and we got into the building only to walk up and down the stairs to find no reception. 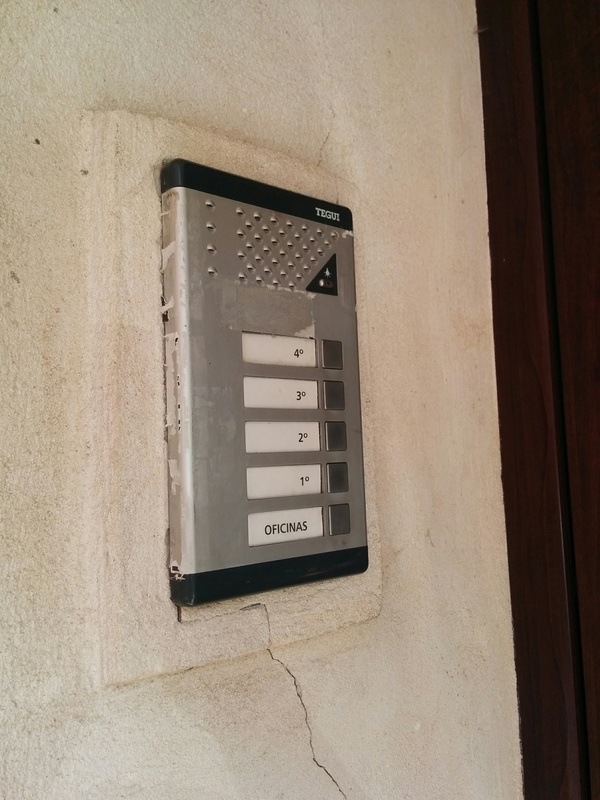 Next door was another bell that said “oficinas”, so we tried that one as well. Nothing. We snuck in there, and while I was charging my about-to-die phone, I asked a resident if the place next door was a legitimate hotel. She said yes. After I also checked a random piece of mail from the mailbox, it became pretty clear that the place next door with the “oficinas” was not our place since it had a different address. Desperate and tired of ringing the bell a million times, we gave up and found another hotel. What the hell? Later when we were connected to WiFi again, I started reading the comments on their website and several people commented on the fact that the reception was apparently 15 minutes away. Why was there no information on the website? Even if you booked through them directly and they send you instructions via email, why does it have to be so complicated? A simple sign on the door would have also helped. The rest of the day in Sevilla turned out nicely with a run along the river, followed by a nice tapas dinner. Ah, the joy of traveling! This was the place. No information that this is not where you check in. Das hier war’s. Keine Infos, dass man hier nicht eincheckt. Oficinas. No office for us here. Keine Büros für uns hier. 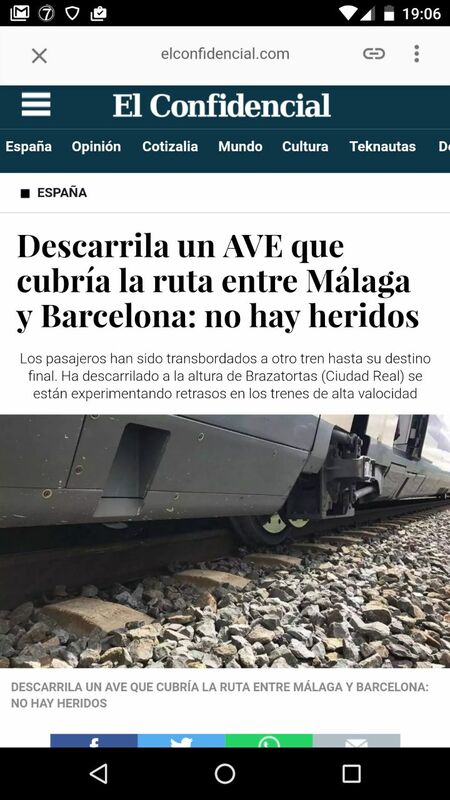 Auf Deutsch sagt man „Wenn einer eine Reise tut, dann kann er was erzählen” und das traf auf jeden Fall auf unsere Ankunft in Sevilla zu. Im Januar hatten wir uns eine Reisekreditkarte zugelegt, bei der wir mit Bonuspunkten Unterkünfte über deren Reiseportal reservieren konnten. 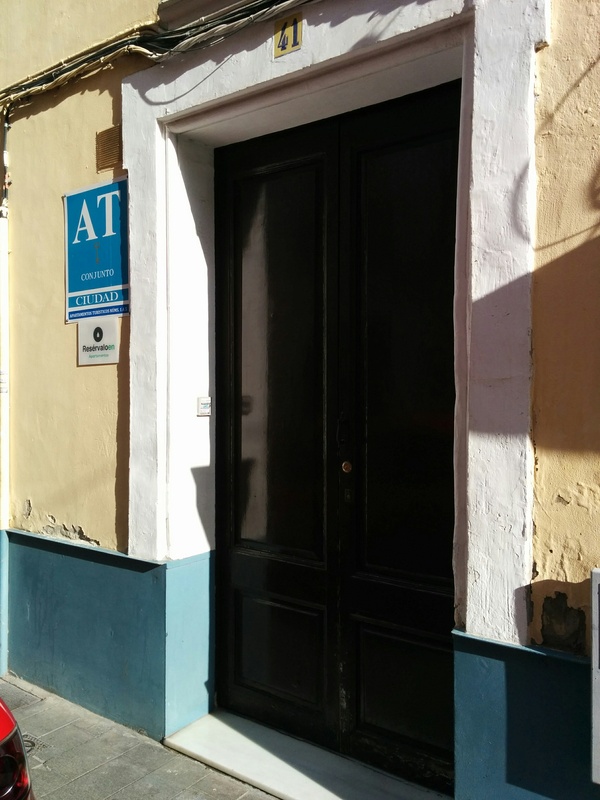 Unsere Unterkunft in Sevilla waren Apartments zur Vermietung. Es gab eine Küche und reichlich Platz. Alles auf der Webseite sah super aus. Bis wir ankamen. Als wir in unserer Straße waren und klingelten, machte keiner die Tür auf. Wir dachten „Gut, die machen wahrscheinlich gerade Siesta”, da es erst 15:30 Uhr war. Wir schlugen also bisschen Zeit tot und kamen eine Stunde später wieder zurück. Nichts. So langsam setzte die Verzweiflung ein und wir gingen ins Kaufhaus Corte Inglés, um nochmal mit meinem Telefon auf die Webseite zu gehen. Dort stand, dass man nach 16 Uhr ankommen solle, was wir so befolgten, aber es war keiner da. Vielleicht war die Siesta dort länger. Wir versuchten es noch ein paar Mal nach 17 Uhr, hatten aber keinen Erfolg. Auf einmal war plötzlich magischerweise die Tür auf und wir konnten ins Gebäude rein, nur um die Treppen hoch und runterzulaufen, ohne eine Rezeption zu finden. Nebenan war noch eine Klingel, auf der „oficinas” stand, also probierten​ wir das auch. Nix. Wir schlichen uns dort rein und während ich mein fast totes Handy auflud, fragte ich eine Bewohnerin, ob nebenan denn ein richtiges Hotel sei. Sie sagte ja. Dann schaute ich mir noch einen Brief aus dem Postkasten an und es stellte sich schnell heraus, dass das Gebäude nebenan mit den „oficinas” nicht unseres war, denn es hatte eine andere Adresse. Verzweifelt und müde von tausendmal Klingeln gaben wir auf und suchten uns ein anderes Hotel. Was sollte das? Als wir später im Hotel WLAN hatten, fing ich an die Kommentare auf der Webseite zu lesen und mehrere Leute kommentierten, dass die Rezeption wohl 15 Minuten entfernt war. Warum stand da nichts auf der Webseite? Selbst wenn man bei denen direkt gebucht hätte und sie Anweisungen per E-Mail geschickt hätten, warum muss das so kompliziert sein? Ein einfaches Schild an der Tür hätte doch auch geholfen. Der Rest des Tages in Sevilla war dann mit einem Lauf am Fluss entlang, gefolgt von einem netten Tapas-Abendessen doch ganz nett. Ah, Reisefreuden! The bell arrangement. 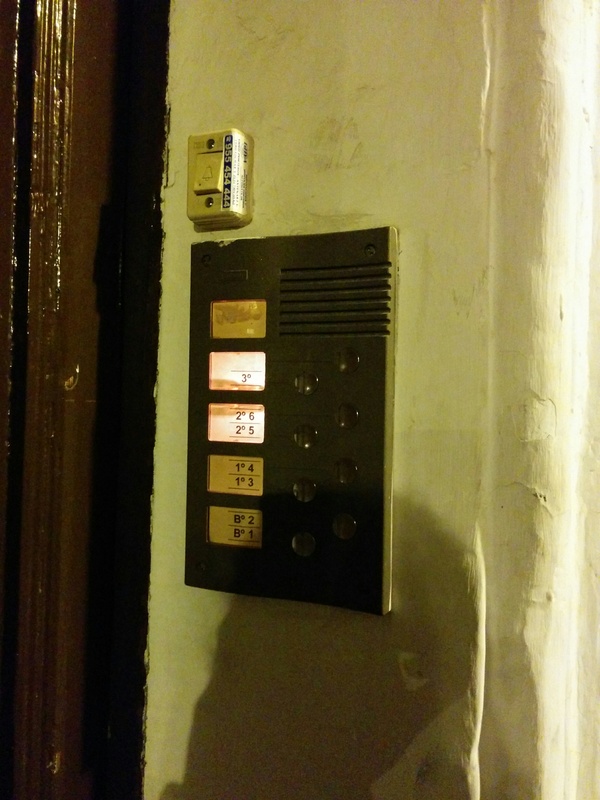 We rang the upper one so many times… Also tried the other apartments. Oh well. Die Klingelsituation. Wir haben bei der oberen ganz oft geklingelt… Haben auch die anderen probiert. Nun gut. This entry was posted in Europe, Spain and tagged Mishaps, Sevilla, Siesta, Traveling on May 15, 2017 by Eva.